After practicing in a hospital pharmacy for many years, Rachel Slaton decided to join McWhorter School of Pharmacy in 2009. 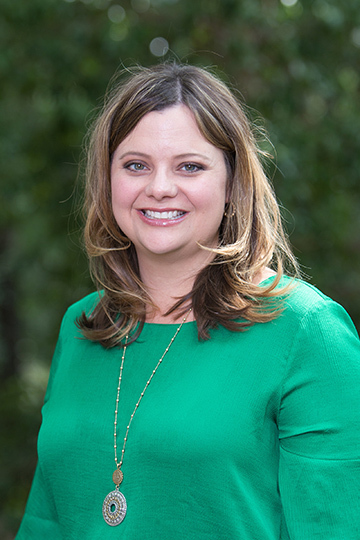 Slaton was charged with developing the skills labs and seminars for a course series in integrated pharmacy applications, and she successfully redesigned the drug literature evaluation course. In 2011, she was appointed to a tenure-track faculty position in drug information where she currently practices. Residency, ASHP accredited Drug Information Specialty Residency, DCH Regional Medical Center, Tuscaloosa, Ala.
Erwin BL, Slaton RM. Varenicline in the Treatment of Alcohol Use Disorders. Ann Pharmacother. 2014. DOI: 10.1177/1060028014545806. Slaton RM, Champion M, Palmore K. A Review of Paroxetine for the Treatment of Vasomotor Symptoms. J Pharm Pract. 2014. DOI: 10.1177/0897190014544785. Slaton RM, Thomas RH, Mbathi JW. Evidence for Therapeutic Uses of Nebulized Lidocaine in the Treatment of Intractable Cough and Asthma. Ann Pharmacother. 2013;47(4):578-85. Slaton RM, Cruthirds D. Indacaterol for Chronic Obstructive Pulmonary Disease. P&T Journal. 2012 Feb;37(2):86-98. Nelson, Monk-Tutor M, Slaton RM, Kendrach MG, Arnold JA. Student-Led Development, Delivery, and Assessment of an Integrated Learning Activity Focusing on Acute Myocardial Infarction. Currents in Pharmacy Teaching and Learning. 2012 Jan;4(1):2-15. “Identifying Medication Safety Risks in the Community Pharmacy” [2 hours]. Samford University McWhorter School of Pharmacy, Office of Continuing Education; Birmingham, AL. “Think Drugs! Recognizing Adverse Drug Events (ADEs)” [3 hours]. Alabama NFI Executive Leadership Collaborative; Northern (Cullman, AL), Central (Birmingham, AL) & Southern (Wetumpka, AL) Meetings. “A Biostatistics Review” [1 hour]. Student Section of ALSHP Summer Meeting; Pensacola, FL. “Medication Safety – Talk to Your Pharmacist!” Spotlight Interview for JOX3-AM690 Brad Radice, Director of Broadcast Media, Samford University Office of Marketing and Communication. “Update on the Medication Use Processes Assessment” [1 hour]. Alabama Quality Assurance Foundation Advisory Council; Hoover, AL. “Medication Safety in the Elderly” [1 hour]. Alabama Alliance for Nursing Facility Quality and Care Coordination (Webinar). Medication Safety: High Risk Medication Strategies [1 hour]. Alabama Pharmacists Association Annual Meeting; Biloxi, MS.
“The Pharmacist’s Role in Medication Safety in the U.S.” [2 hours]. Meijo University Visiting Scholars, Samford University McWhorter School of Pharmacy. “New Drug Update” [2 hours]. Alabama Pharmacists Association Mid-Winter Meeting, Guntersville, Alabama. Alabama Alliance for Nursing Facility Quality and Care Coordination – FOA# CMS-1E1-12-002 [Initiative to Reduce Avoidable Hospitalizations among Nursing Facility Residents]. U.S. Department of Health and Human Services, Centers for Medicare and Medicaid Services, Medicare and Medicaid Coordination Office, Center for Medicare and Medicaid Innovation. Collaboration with Alabama Quality Assurance Foundation (AQAF), The University of Alabama at Birmingham, Samford University and Alabama Department of Senior Services. Research grant from the state Attorney General Consumer and Prescriber Education Grant Program which is funded by the multi-state settlement of consumer fraud claims against Warner-Lambert (now a division of Pfizer, Inc.) regarding the marketing of the prescription drug Neurontin®.